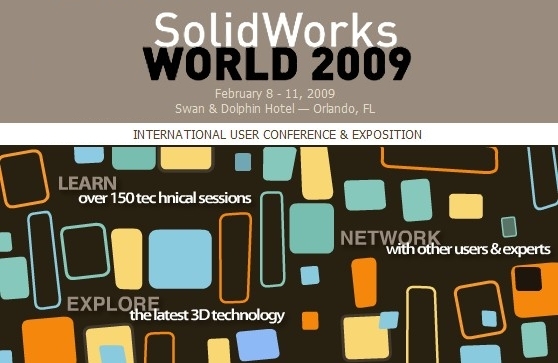 SolidWorks World 2009 Website is LIVE! The headline and banner image above pretty much says it all. Click on the image to see the new site. Time to start working on your justification letters. Leave me a comment if you are going. Maybe I’ll see you there! Also, if you are interested in presenting at SolidWorks World – CLICK HERE to submit your abstract. - November 11, 2012 12:21 AMIn the world, that oven symbolizes gablol warming. Some retailers offer you presents, and this can be a excellent way to discover what you need at wonderful prices. It includes frost protection and features a powerful 255 CFM fan, washable aluminum MERV-8 filter, sensors to automatically detect moisture levels and maintain the desired level, locking casters for portability and safety, and 1″ PVC condensate trap pipe to attach to hoses or condesate pumps. Additionally, they’ve support and the numerous filter systems that you need for your particular fridge model. Excelente artÃ­culo, salvo: “… los consumidores no somos gente inculta a la cual se le puede decir y prometer cualquier cosa en un spot publicitario pensando que nos lo tragamos todo sin rechistar” Por desgracia, el nivel general de tonterÃ­a estÃ¡ muy alto, las empresas lo saben, y lo que es peor, los polÃ­ticos tambiÃ©n.